Bruce Springsteen cover band pulls out of inauguration. Sad! Despite Trump's tweets to the contrary, Donald Trump's presidential inauguration is looking like more and more of a disaster with every passing minute. 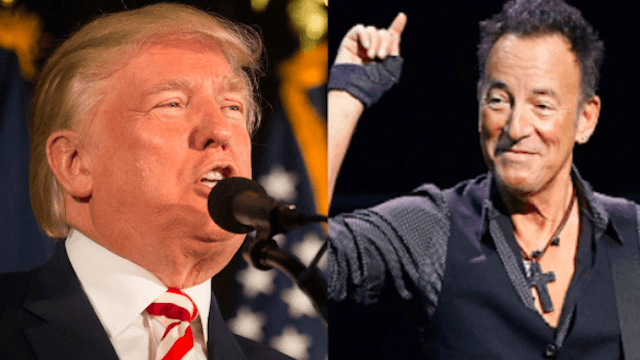 The B-Street Band, a well-known Springsteen cover band that played the last two inaugurations, is bailing on their performance at Thursday's Garden State Presidential Gala, out of respect for Springsteen himself, who has called Trump a "moron" and a "flagrant, toxic narcissist." We had to make it known that we didn't want to seem disrespectful, in any way, shape or form, to Bruce and his music and his band. I don't want to upset them. We owe everything to him and our gratitude and respect to the band is imperative above all else. It became clear to us that this wasn't working and we just had to do what we thought was the right thing to do and that was to pull out. The band had signed the contract for the gig back in 2013, but recently found themselves in the middle of a whole lot of controversy, due to the current political climate. "As time went by, the complexity of the situation became real immense and intense. The band was caught in a hurricane. We didn't see this coming, of course," Forte told Rolling Stone. Springsteen himself hasn't said anything about The B-Street Band's scheduled performance, but the E Street Band's original bassist, Garry Tallent, tweeted, "Please tell me this is more fake news. Or at least a joke." And Steven Van Zandt, the E Street Band guitarist, tweeted, "Nice guys. Met them. I wouldn't say right or wrong. Up to them. But it's naive to think one can separate Art and Politics. Art IS Politics." All this stuff made it clear to us that this event is not worth it. It's just a job to us. We're just trying to hold up a contract. We're not trying to prove anything. We're just a fun band!